The Doctor is contemplating the mysterious Clara in solitude when fate, or a mysterious woman in a computer shop, puts them in touch. It’s not a moment too soon, as something has invaded the wifi. As an introduction to a new companion, this story works exceptionally well. We know by now that a companion can never really be killed off, but the guest cast can be. So the sense of jeopardy for our heroes is usually diminished. We can never be quite sure that the same trick won’t be pulled again in killing off Clara here; so there’s a vulnerability and sense that she might not make it through this episode. A difficult trick to pull off, and it’s a testament to the new companion’s immense likeability that we care and aren’t bored by the idea that she could die again. The plot is pure Doctor Who, taking a modern innovation that’s prevalent in all our lives and making it a chilling threat. The tablet Miss Kizlet used to change people’s characteristics like a twisted Top Trumps is particularly unsettling. It’s fitting that in a story featuring a returning Second Doctor foe that computers are used; that incarnation had an instinctive mistrust and dislike for them. Steven Moffatt said in a recent interview on Outpost Skaro that the Bells of Saint John ‘prequel‘ was a deliberate echo of the Doctor’s first meeting with Amy. More than that, a pattern is emerging where the Great Intelligence is mirroring his behaviour, setting this adversary up as the Eleventh Doctor’s greatest nemesis. The Intelligence has corrupted both Simeon and Miss Kizlet when they are children, while the Doctor gives them adventure and self-belief. 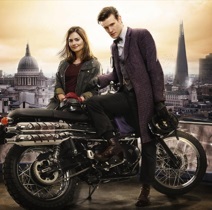 Matt Smith continues to innovate in the role of the Doctor, his reactions and mannerisms still not familiar or predictable in the way that Tennant’s became. When he realises that Clara has made a joke about Twitter, the expressions he gives are completely new to the character. Reminiscent of Tom Baker striving to find new and interesting ways of walking through doors. Once again the Doctor ignores or forgets vital information. Who was the woman that gave Clara his phone number and who was the client that Miss Kizlet referred to? We know the latter, but he doesn’t follow it up. I wrote in more detail about this aspect of the current incarnation here. If nods to previous Doctors are to be found, perhaps here it’s in the Doctor playing Abbot to the monastery in Thirteenth Century Cumbria? (The First Doctor was a dead ringer for the Abbot of Amboise in the other Doctor Who story to feature the word ‘Saint’ in the title, The Massacre of Saint Barthelomew’s Eve). The Doctor spending some time in Cumbria gave rise to a small cheer in our house… where I live is finally canon! Even if it is in 1207, not a great deal has changed.